SCDNR freshwater fisheries biologist, Mark D’Ercole, with an Atlantic Sturgeon caught in the Great Pee Dee River for research activities within the guidelines of the National Marine Fisheries Service Biological Opinion #2206-030. Have you ever caught a fish that was too big to bring into the boat? That happened last week in the Great Pee Dee River to SCDNR Freshwater Fisheries staff Mark D’Ercole and David Hood. 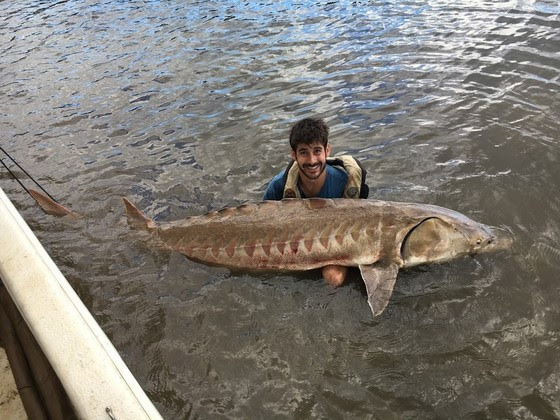 The fish was an Atlantic Sturgeon measuring eight feet, eight inches long, and as for the weight, it is unknown because “we couldn’t even pick it up together while wading beside it,” said biologist Mark D’Ercole. This is all part of a multi-year study by SCDNR to study spawning behavior of these ancient fish in the Great Pee Dee River. The Atlantic Sturgeon is a prehistoric fish that is found along the Atlantic Coast of the U.S. and inhabits most of South Carolina’s major river systems. Historically, it was harvested for its meat and roe (caviar), resulting in major overall population declines in many Southeastern rivers and eventually led to it being listed by the National Marine Fisheries Service (NMFS) as an endangered species in 2012. Fisheries biologists are currently tagging fish with acoustic transmitters to track their movement. The NMFS provided specific guidelines for SCDNR’s research activities in the Great Pee Dee River, and the project is focused on adult Atlantic Sturgeon in excess of five feet long. Project results will help to identify habitat needed for reproduction, which is an important factor for the recovery of the species. Due to the requirements of the project, SCDNR is using sampling gear that targets and has the strength to capture large fish, and sampling with those gears over the past year has brought to light some impressive fish that call the Great Pee Dee River home.